Join the Professional Women's Council's for their next Networking Luncheon at our new location! Find Out How "Cause Marketing" Can Help You in Your Personal & Business LIfe. 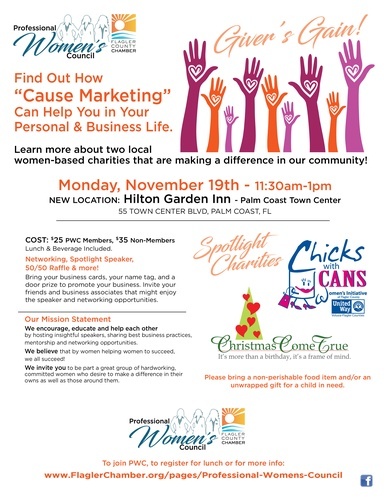 Learn more about two local women-based charities that are making a difference in our community! Please bring a non-perishable food item and/or an unwrapped gift for a child in need. Planning to attend? RSVPs are required by Nov 14.